Looking for a kennel to drop your pet off while you’re at work or away on vacation? 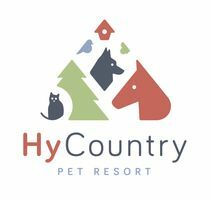 Hy Country Kennels & Pet Resort has been in business since 1999 and is located just minutes outside downtown Vernon yet offers an exquisite country environment. Our 10-acre facility has the most amazing view of Okanagan Lake and the city of Vernon. This makes Hy Country Kennels & Pet Resort the ideal choice for pet boarding in the northern Okanagan region. Viewing is always welcome during business hours. We are open seven days a week in the morning and afternoon for drop off and pick up. Feel free to get in touch to learn more. We provide daycare services for your pets for when you’re at work. Our indoor and outdoor facility is minutes away from downtown Vernon. Over the years, we’ve had plenty of happy pet owners and guests stop by. Hy Country Kennels & Pet Resort offers both indoor and outdoor environments. Our outdoor environment has six exercise parks for your pets to run, socialize and play at. We also play music in our kennels so that your pets can have a relaxing atmosphere. Our indoor environment is the perfect place for your pets to warm up during the winter months. Our upgraded HVAC system offers the perfect temperature for your pets, no matter the season. At Hy Country Kennels & Pet Resort, we are committed to keeping your furry family member happy and healthy during their stay at our kennel. As a result, all of our staff have a certification in Dogsafe Canine First Aid. For special needs pets, we can also administer medications or supplements during their stay.